Winemaking, like baking bread or beer brewing, is one of humankind’s most ancient food-manufacturing processes. And, just as baking and brewing leave behind cereal stalks and spent grain, winemaking produces one of the most ancient of waste products: Pomace. Pomaceis the general term for any solid material — such as the skins, pulp and seeds — leftover after wine or juice has been made. Whether from winemaking, juice production or cider pressing (pomme in French, means apple), pomace is a universal constant wherever people have sought to extract the liquid goodness from fruit. And, just like in ancient Rome (where the goddess of fruit’s name was Pomona), winemakers are still trying to answer the universal question of what to do with their pomace after the fruit has been pressed. Whether you produce five pounds of pomace or five hundred, there’s probably something creative that you can do to get some extra mileage from your hard-won grapes. Simply put, the composition of pomace depends largely upon what kind of wine is being made and at what stage of processing the liquid has been pressed out. If a white wine is being made, the juice is pressed out of the grapes first, before fermentation. The resultant pomace is rich in sugar, nitrogen, amino acids and other goodies that didn’t make it into the fermentation tank. When making red wine, the intact grapes are fermented along with the juice. The resultant red pomace, which is pressed off after fermentation, is depleted in sugar and has already given up many of its tannins and colored compounds into the wine. Pomace, even when fermented, contains a staggering variety of chemical components. The skins mainly consist of cellulose, tartaric acid, trace amounts of other organic acids, unfermentable sugars, tannins, anthocyanins (plant pigments) and some aromatic phenolic substances. The seeds, which remain largely intact during pressing and fermentation, are gold mines of bitter and astringent tannins. The seeds also contain large amounts of a nutritious oil, which is gaining popularity with chefs due to its high smoke point. Stems contain mostly tannins and, if the pomace is pressed from a fermented wine, it will contain water and alcohol. White or red, pomace varies in moisture content depending on how hard it has been pressed. White pomace, often pressed gently to avoid extracting bitter compounds into a delicate white wine, can end up juicy and sticky with sugar. On the other hand, red pomace often forms amorphous clumps and can be quite dry to the touch. Anything added during the juice or winemaking process — like enzymes, bentonite or yeast — will be present in the pressed pomace. 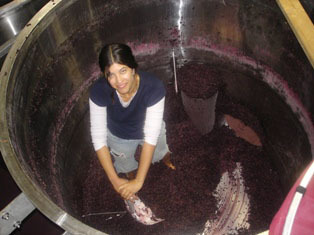 Economy-minded winemakers have historically tried to turn pomace into other grape-based products by simply soaking pressed white skins in water and fermenting the mixture to make a weaker, “second wine.” Another technique for recycling spent skins is to steep and then distill alcohol-rich red pomace to make a spirit. Modern, large-scale productions sometimes sell their white and red pomace to third-party plants that grind the seeds to extract grape seed oil and mine the skins as a source of cream of tartar. Some wineries sell their pomace to silage processors who turn the oil and fiber-rich grape skins, as well as other agricultural “waste,” into feed supplements for cattle. Still other wineries choose to recycle their pomace as compost in the vineyard. Sometimes — when the above options aren’t feasible — pomace just ends up in the local landfill. Most wineries, however, aren’t generating enough pomace to sell as a tartaric acid source or to grape seed oil processors. Small-scale wineries and home winemakers want to use pomace in ways that are easy, quick and — above all — directly beneficial. To that end, the re-use of spent skins in winemaking has been a logical choice for many. After a year of anticipating the ripeness of those precious clusters, it’s not surprising that many winemakers go to great lengths to literally squeeze as much goodness as they possibly can out of those skins. To kick the previous idea up a notch, or just to give it a little “kick,” the logical progression of using pomace in the realm of beverage manufacture would have to be distillation. There is a long and glorious (or perhaps just hot and fiery) history of turning pomace into booze. From the marc of France to the grappa of Italy, folks with stills have for centuries been making grape-skin brandy (also classified as eau-de-vie) in one of two ways. The first method starts with a “second wine,” weaker than that mentioned in the previous paragraph, made simply by fermenting pressed white pomace (remember it still has some sugar in it) and a little bit of water. The resulting low-alcohol wine (or sometimes the whole must, skins included) would be loaded into the still and heated until all of the alcohol had vaporized and had been re-condensed into a higher-proof liquor. The second method involves fermented red skins and calls for macerating them overnight in a small amount of water and then distilling this mixture. Remember, fermented pressed red pomace usually has no sugar left but — if used within 24 hours of pressing — still has quite a bit of alcohol in it. Please note distilling at home without a goverment license is illegal in most countries including the United States and Canada. If you’ve got any kind of garden or home vineyard, perhaps composting is the best way to put your pomace to work. The benefits of using homegrown compost are legion. Incorporating compost into your garden soil improves the soil structure, boosts positive microbiological activity, increases soil nitrogen, and provides minerals and other micronutrients to your plants. It can improve both soil drainage and its water holding capacity, meaning that you’ll have to water less and that your plants won’t get waterlogged when you do. Compost can also be used as a mulch to assist in weed control — laying down one or two inches (2.5–5.1 cm) of compost can completely stop weeds in their tracks, something that all gardeners can agree would be a good thing. Any kind of pomace can be used for composting, with or without stems, fermented or unfermented, wet or dry. Start a compost pile (called a “windrow” by some aficionados) well away from the house or home winery as it will attract fruit flies as it ferments and decomposes. Consider adding other organic elements to your compost pile; things like lawn clippings, kitchen vegetable waste, manure and straw to help raise the pH of the pile and serve as bulking agents, keeping the pile aerobic and open. Though eggshells are fine for compost piles, it’s not a good idea to add meat scraps or whole eggs to as protein has a hard time breaking down in the compost windrow. Which brings us to the key concept in composting: decomposition. In order for the nutrients and nitrogen to become available to your soil and plants, the organic matter in the compost needs to be broken down by heat, microbes, oxygen and time. Experts suggest using a pitchfork to completely turn over your compost pile every six to twelve days to keep it from getting anaerobic, smelly and from breeding undesirable microorganisms. Monitor the internal temperature with a long-probe thermometer and keep the pile between 131–150 °F (55–66 °C) for at least 15 days to kill off weed seeds and harmful pathogens. Be careful of it getting too hot, however — over 160 °F (71 °C) and the heat might kill off the beneficial microbes which are doing the work of digesting your organic matter. The compost should always be moist and have the consistency of a wrung-out sponge. If it dries out, add a bit of water, a little at a time. During rainy seasons, it’s a good idea to cover the pile with plastic to keep it from getting too wet. Each compost pile is different, but if you follow these guidelines (unless you live in a very cold climate) you should have useable compost in four to six months. Compost can be tilled into the soil in spring in anticipation of the planting season or it can be used as mulch year-round to control weeds. In the vineyard, it can be applied at a rate of one ton per acre to help boost the nutritional profile of established vineyards and two to three tons per acre to prep a vineyard site for new plantings. The use of pomace compost in commercial wineries has been shown to increase yields without decreasing grape quality. Additionally, for winemakers worried about the root louse phylloxera, incorporating compost into the vineyard soil can provide an added benefit as compost opens up compacted clay soils which phylloxera tend to prefer. There’s no doubt that using pomace for compost is one of the most popular and effective way to “dispose” of skins, seeds and stems. Composting is cheap and easy and means less bulk in your local landfill and better grapes for you next season. However, if you’re thinking about giving away compost, or even selling it, it’s a good idea to check with your local law enforcement, county environmental health and safety departments first. Because of worries over the movement of invasive species, especially weeds, there are often regulations that govern the movement of agricultural waste. For more information on composting in your area, check in with university cooperative extensions, local gardening leagues and integrated pest management organizations. As if distilling, composting and winemaking weren’t enough, pomace is leaving behind the humble pot stills and compost piles of the world and is popping up everywhere from natural food stores to cosmetic counters. Grape seed oil is used extensively the skin care industry for its excellent emollient properties. Top of the line European and domestic cosmetics companies are claiming that the anthocyanins and tannins (all good antioxidants) found in grape skins help disguise and possibly delay the signs of aging. Pomace is appearing in other unusual places; powdered grape seed extract is sold in capsules in drugstores, ground pomace is baked into protein bars and spas in Napa Valley offer grape skin wraps and grape seed scrubs. Not all miraculous claims made on behalf of the grape are fanciful, however. Dr. Osman Sagdic, a Turkish researcher at Erciyes University, has developed a new antimicrobial agent extracted from grape pomace that he hopes could someday be a natural alternative to artificial preservatives in foods. Published in the August 2004 issue of the Journal of Science of Food and Agriculture, his study showed his pomace extract, at a 5% concentration, killed all food borne pathogens it encountered. As the world becomes more interested in natural and sustainable alternatives in the arenas of food, beverages and personal care, it’s certain that pomace will be viewed as a potential source. So save some landfill space and give your pomace a second chance. Start a compost pile, mulch your asparagus or donate those juicy Tempranillo skins to your subsequent batch of Cabernet. While you might not be making scientific breakthroughs with the dregs left over from your “Summer Time Sparkling Chardonnay”, it’s safe to say that — with a little creativity — you can find something beneficial to do with your leftover grape pomace.